PunktB is a venture capital and venture management firm focusing on early-stage and growth investments. 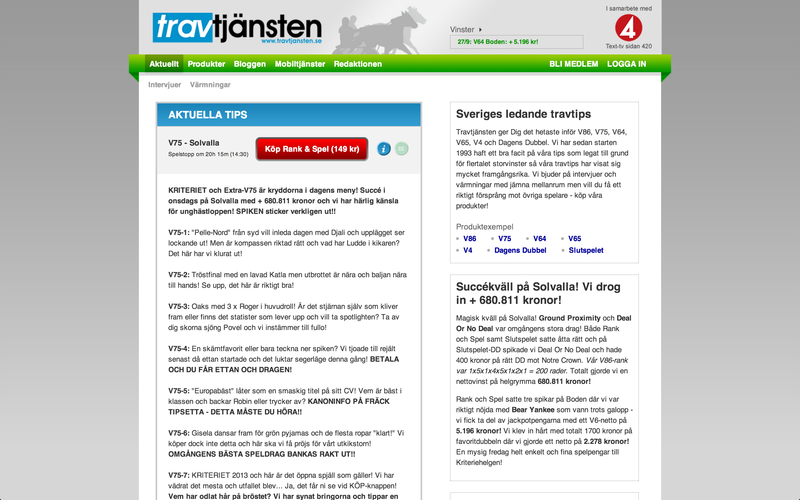 Travtjänsten Sverige AB has been a leader in providing exclusive research and analysis on trotting since it launched in 1993 through the company Trav- och Sporttjänst AB, founded by Anders Ström, later the founder of Unibet Group Plc. Its advanced methodology and skilled analysts provides data and information that offers its customers an edge on the Swedish horse racing market. Betting on horse racing in Sweden is provided by the Governmentally licensed monopoly, ATG.se. "When I think about growth, PunktB is the first thing that comes to my mind. Through ventures like Shortcut, Talent Scout and later on DMH I’ve gotten to experience planting a seed, nurture it and later on shedding its fruits. Through these journeys PunktB has not only been the water and nutrition - it’s a company built by people that gives me guidance when I’m tired of digging dirt, and picks me up when I fall off the latter. I admit, there was a time when I considered starting new businesses without involving PunktB. I’ve also considered base jumping and other endeavors that would be nothing but dumb." "As an entrepreneur I have had Michael and Linus involved in my two startups the past 14 years. They are always by my side, providing advice in both strategical and operational questions. They bring so much more than cash to the table, they bring themselves their competence and a will to grow me as a person more than their investment."